When you think of Samsung, you may automatically think of Android. After all, Samsung’s devices – smartphones, in particular – have been a driving force in Android’s success, so much so that it’s putting the mobile operating system into some of its cameras. You’d think Samsung is firmly married to Google’s OS, but the company actually has its own OS called Tizen (which is a follow-up of another Samsung OS called Bada), a Linux-based open-source operating system it developed with Intel. While we probably won’t see a Samsung smartphone running this Android alternative until sometime in 2014, the company did announce at the Tizen Developer Summit in Seoul that Tizen is already running in one of its cameras, the NX300M. Available only in the South Korean market, the 20.3-megapixel NX300M is a version of the NX300 that features a 180-degree tilting display. Although the camera was launched in October, Samsung only recently revealed that it operates off the Tizen Camera Platform. What does Tizen bring to the table? 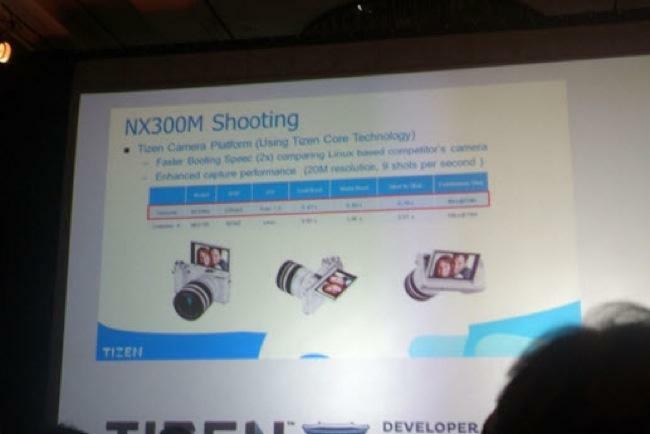 Even though the specs don’t differ too much from the NX300, during a presentation at TDS, Samsung Executive VP Jon-Deok Choi showed a slide that states the camera has a 2x faster boot-up speed and better performance. In the future, it could support features and apps like maps from Nokia and other third-party developers (which currently has 36 companies lined up). It’s too early to tell what type of effect Tizen will have on the development of Samsung’s “connected” cameras, but it seems the NX300 may also be running off Tizen (Samsung released firmware source codes for the NX300 and NX2000 this past May, with an architecture that’s based on Tizen). If Tizen proves successful, we could see Samsung rolling out more cameras with the OS alongside Android – if consumers buy into the whole smartphone-OS-in-a-camera functionality, that is.